The mastermind of Friday's attacks was targeted in the raids. The overnight raids by French police thwarted a terrorist group that was reportedly ready to act, Paris Prosecutor Francois Molins said this afternoon. 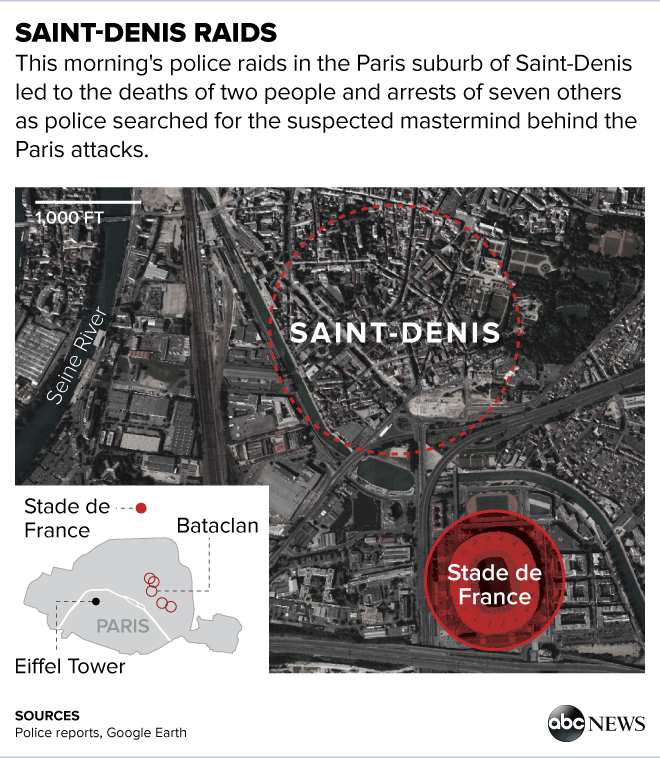 Molins said details about the raid in the Parisian suburb of Saint-Denis are still being investigated but a total of eight people were arrested as a result of the police activity. The identities of the eight people who are being interrogated, as well as the two people who died in the raid, have not been released. Molins did confirm that Abdelhamid Abaaoud, the alleged mastermind of Friday’s Paris attacks that killed 129 people, was not one of those detained. The whereabouts of Abaaoud remain unclear but he is believed to have been the target of the raid. Police fired nearly 5,000 rounds during the Saint-Denis raid, Molins said, adding that it was a particularly difficult raid because the apartment had an armored door. Cellphone records and surveillance gathered since Friday’s attack led police to believe that Abaaoud may have been in an apartment in Saint-Denis, prosecutor Molins said today. It was initially unclear whether he was there. From a growing number of arrests and searches to strong words from the French president, here is the latest news on the French terror investigation. French President Francois Hollande said the aim of the raids overnight were to "neutralize" terrorists linked to the attacks on Friday. The operation started with shootings at 4:30 a.m., officials said. It first resulted in the arrest of three people inside an apartment. At that point, a woman triggered a suicide vest. Another person died from a projectile and grenade, officials said. Two others were arrested, as well as the person who rented the apartment and a friend. The police are not identifying any of those arrested. 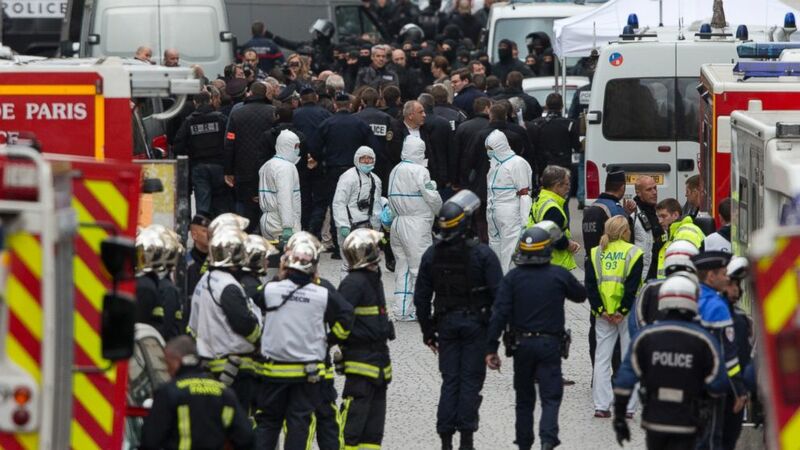 Searches are still underway and a heavy police presence remains in place, but a French government spokesperson confirms that the raids are now over. President Obama was briefed on the raids by his national security team, an NSC official told ABC News. Witnesses reported ongoing gunfire starting at around 4:30 a.m. local time in Saint-Denis, not far from the Stade de France, one of the targets in Friday's terrorist attacks. A number of residents in the area were offered safe refuge in City Hall, but police asked that everyone stay inside with windows closed, according to a press officer with the Saint-Denis Mayor’s office. Schools and shops in the area are to remain closed. (Peter Dejong/AP Photo) Forensic experts in white suits wait for a go ahead after an operation of security forces against a group of extremists in Saint Denis, near Paris, Nov. 18, 2015. How Many Raids Have There Been Since the Attacks? This morning's raid was just part of the larger ongoing manhunt. The French Interior minister reported today that there have been a total of 414 searches, 118 of which took place overnight alone. Of the 118, there were 29 interrogations and 25 people taken into custody. Those individuals represent almost half the total number of people who came to the attention of police, according to the Interior minister. All told, there have been 64 people held for questioning and 60 people kept in custody. In addition to those individuals, 118 people have been placed under house arrest. Police have seized 75 weapons, 11 of which were classified by Interior Minister Cazeneuve as "war weapons," though no further details were given.